Many thanks to Pocket Change Gourmet for this recipe. It was a nice change from traditional Deviled Eggs. If you love bacon you should give this one a try. 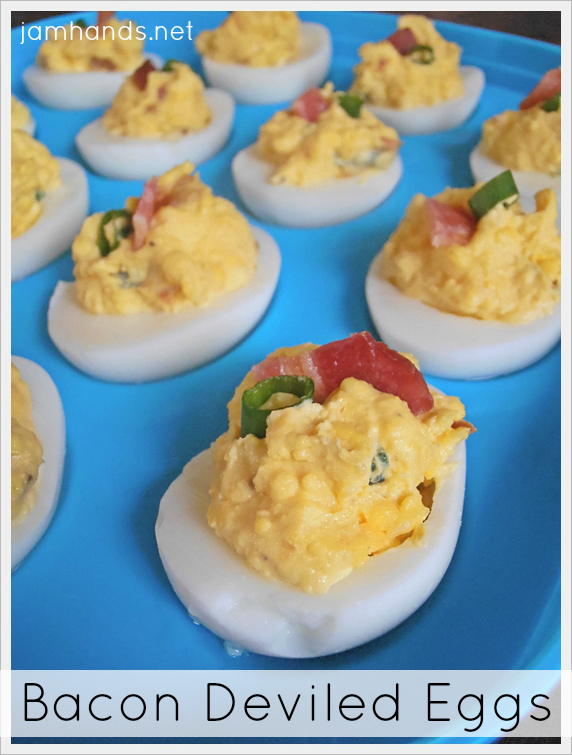 For an Easter get together I would make one try of traditional Deviled Eggs and one tray of these Bacon Cheese Deviled Eggs for variety. Enjoy! Note: I used the advice from this post by The Kitchen for boiling eggs. I didn't worry about centering the egg yolks, but I did follow the instructions noted for cooking the eggs slowly and following that up with an ice bath. This method worked pretty well. I only had 1 or 2 eggs that were really difficult to remove the shells from, and the rest were very easy as long as you are extra careful. 1. Cook bacon. Let cool then crumble into small pieces. 2. Slice hard boiled eggs length-wise and scoop out yolks, place yolks in a mixing bowl. 3. Mash yolks and mix in the bacon, cheese, green onion, mayonnaise, mustard and black pepper. 4. Spoon or pipe the mixture into the egg whites. Refrigerate until serving. Recipe from Pocket Change Gourmet. Sharing this recipe at the following fun link parties. 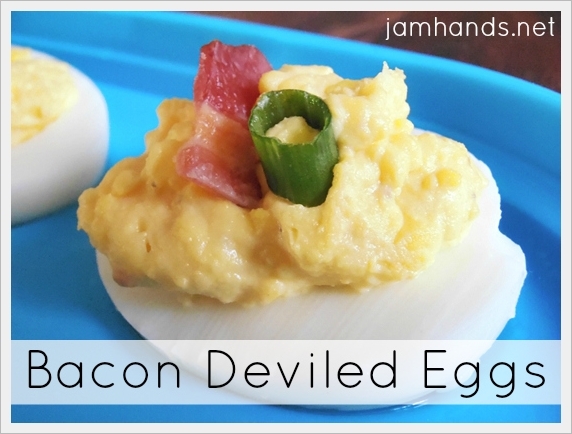 What a great twist on deviled eggs! These look delicious! Bacon and eggs all in one little package! Love it Ali! Sorry about that - Accidentally left it out. Add it in at the same time as the bacon and other mix-ins. I'll fix the directions now.